Nancy goes behind the scenes at the circus and finds big trouble under the big top. Nancy’s in Sarasota, Florida, winter site of the Grand Royal Circus, to help trapeze artist Natalia Petronov look into her heritage. Adopted as an infant, Natalia is now determined to find her real father. But as Nancy searches for clues in a shadowy past, one thing becomes instantly clear in the present: Natalia’s life is at risk! 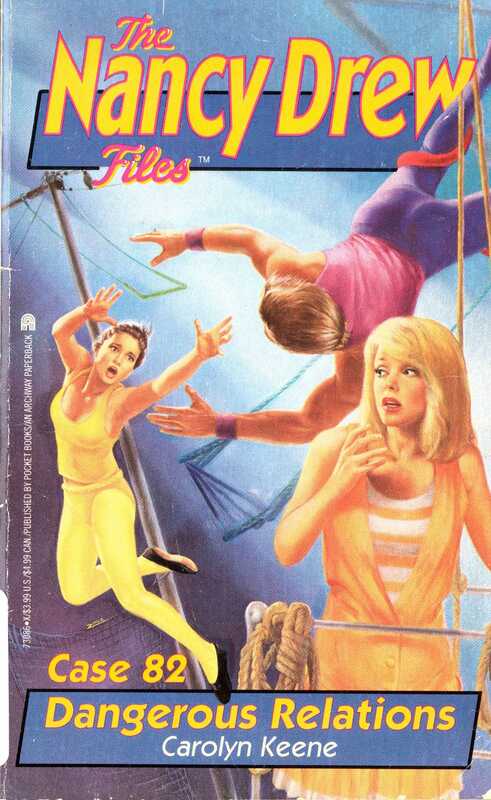 Natalia flies through the air with the greatest of ease—until someone messes with her trapeze. And whoever’s playing tricks is definitely not clowning around. The circus of danger is about to begin, and in the center ring lies a deadly secret. The search for the truth could lead Natalia—or Nancy—to take a hard fall…without a net! Authorized vehicles only." Nancy Drew read aloud the sign on the gate just outside the Grand Royal Circus. She nosed the car she had rented at the Sarasota Airport into a space in the shade of a palm tree. Bess Marvin, Nancy's good friend, yawned and fluffed her long blond hair. "How'd you ever talk me into a middle of the night flight?" "I promised you sunny Florida, that's how," Nancy reminded her, climbing out of the car. "It sure feels warm compared to the weather we left in River Heights," George Fayne said. George was Bess's cousin, and the three girls were almost inseparable. "Humid, too. Your hair is curling." Bess gave her cousin's short dark curls a little pat. Then she shivered. "But is it warm enough to go to the beach?" "Don't even think about it," Nancy said in a mock-stem tone. "We're here to work, remember?" Though she was only eighteen, Nancy had quite a reputation as a detective. She had been intrigued when Hayden Gentry, trainer and catcher for a flying trapeze act, had called her a week earlier and asked for her help. His girl friend, Natalia Petronov, wanted to find her biological father. Natalia had been born in Moscow, so the chances that an American detective could find Natalia's father were slim, but Hayden seemed to think Nancy might be able to do it. And Nancy was willing to try -- especially since it meant spending a few days with the circus in Florida! Nancy stopped inside the gate and took a long look at the circus grounds. It was a rectangular lot, longer than a football field. Parking for the twenty or thirty travel trailers began at her right, then turned and followed the fence along the width of the field. There were buildings, stock pens, and an outdoor ring on the opposite side of the lot. Around the entire perimeter of the grounds was a beaten track. In the middle of the lot, men and machines were working to raise a huge red-and-white canvas tent. Hammers rang out as workers made repairs on bleachers. Other workers were painting a concession wagon, a ticket box, and souvenir stands. The scents of dust and paint hung in the morning air. "Look at the elephant!" Bess exclaimed, pointing to the huge beast harnessed to a cable. "Bet he's going to raise the tent," George said, edging closer. As the girls watched, a bearded man with a cigar clamped in one corner of his mouth left the workers and hurried over to them. "Can I help you?" he asked. "We're looking for Hayden Gentry," Nancy said, then introduced herself. "Oh -- the detective," the man said in a neutral tone. "I'm Marshall Keiser. I own this mud show." "Hayden said you're going on the road in less than a week. Looks like a big job, getting every thing ready," Nancy said. "Yep," Keiser said. "Rehearsals start tomorrow, and things are hectic." He shouted to the elephant trainer, "Okay, Burton. Bring it up now." The elephant pulled hard on the cable. The flag at the top of the pole flapped as it slowly and steadily, rose to vertical position. "Hayden and Natalia will be practicing -- assuming Her Excellency isn't too big-headed to practice." But Keiser didn't explain his sarcasm. Instead, he pointed across the grassy lot to the buildings. "The tall one's the practice arena." Nancy thanked him, then started across the lot with Bess and George at her side. "Hey!" Keiser shouted. "Go back to the road and follow it around. Can't have you in the way with the tent going up." Wondering if he was always so abrupt, Nancy led her friends back to the path. And what had he meant by calling Natalia Her Excellency? "What's a mud show?" George asked. "A tent circus. A little rain, and the lot turns to mud," Nancy explained as they walked past the row of trailers. "This is the winter home for the circus. They're getting ready to take it on the road." Nancy looked with interest at a large mesh globe that sat between two trailers. The steel ball was so big that a small car would have fit snugly inside. "That's a prop for a motorcycle stunt," George told her and Bess. "The rider rides his bike inside the globe. I've seen it on TV." Nancy smelled the aroma of coffee as they passed another trailer. She wondered if it was the circus's cookhouse. Next to it was a circus ring where a woman was working some beautiful dappled horses. Finally they reached the corrugated steel arena. Inside, colorful circus posters hung along a wide hallway. Nancy noticed an office door with Marshall Keiser's nameplate on it and a second door labeled Props. At the end of the hallway was a large open room that served as the practice area. Mats and riggings were everywhere. Nancy saw a red- haired woman mount a trampoline near the center of the room. Not far from her, a man and woman were stretching on mats. The man had a muscular build, blond hair, and bright blue eyes. "Is that Hayden?" Bess asked. "I think so," Nancy said. "I only met him once, two years ago when he was visiting River Heights. His aunt is a friend of Hannah." Hannah Gruen, the housekeeper for Nancy and her father, had invited Hayden and his aunt over for dinner. Hayden, twenty-four at the time, had seemed a lot older than Nancy. Of course, she'd still been in high school then. Hayden's face lit up with a smile as he spotted Nancy coming. He got up from the mat, went over to her, and shook her hand warmly. "It's great to see you again, Nancy. I'd like you to meet Natalia Petronov." Natalia, who had followed him over to the spot where the group was standing, had brown hair neatly coiled on the back of her head. She had deep-set dark eyes, high cheekbones, a firm chin, and a sweet smile. Nancy liked her instantly. Nancy introduced Bess and George. Natalia greeted the three girls enthusiastically. "Hayden's aunt is always sending him clippings about the cases you've solved," she told Nancy. "I can't thank you enough for coming. " Nancy smiled. "I just hope I can help you." "Are you the only ones practicing?" George asked, looking around. Natalia nodded. "Nine o'clock is our time to use the gym." "The high-wire team, which usually practices after us, is helping set up the big top today, so we'll get a little extra time," Hayden said. "And we can sure use it," Natalia said. "We do two local shows before we go on the road, and we're still smoothing out the edges." The red-haired woman leapt off the trampoline and came over. Nancy guessed she was in her mid- to late twenties. Hayden introduced her as Katrina Van Swalla, the third and last member of the aerial team. Katrina greeted them, then turned away, saying, "Can we get started?" As Nancy looked on, Katrina climbed a rope ladder to a small platform high above the ring. The bar, which hung from rope cables, squeaked as she caught it with a hook and pulled it toward her. Nancy watched a moment, thinking Katrina was going to swing out on it. But she simply stood on the platform, holding it. Perhaps she was preparing herself mentally. "I didn't realize you'd get here this early," Hayden apologized. "Oh, go ahead and practice. We'd love to watch," Nancy said. Bess and George echoed agreement. "When you see the girls fly, you'll understand why we call our act Angel Wings," Hayden said proudly. "Hayden's such a great catcher, he makes us look good." Natalia smiled at him and started up the same ladder Katrina had just climbed. Hayden scaled a second ladder and stood alone on a platform that faced the one on which Natalia and Katrina waited. A trapeze bar hung near each platform. One was for the catcher, the other for the leaper. The object, Nancy knew, was for the leaper to let go of the bar, fly through the air, be caught by the catcher, then return to the other bar. "There are some chairs against the wall," Nancy said. "Let's go sit down." "Katrina's got an eye for fashion," said Bess, who loved clothes. "I like the way her pink sash dresses up that leotard," she went on as she sat down. George, who was a natural athlete and cared little about fashion, said, "Trapeze artists have to be great athletes. Strength and timing are all- important." She sat down beside Nancy, and they all looked up expectantly at the trapeze artists. Nancy's breath caught as Hayden swung onto his bar. He built speed, then brought his legs straight up. The muscles in his calves stood out as he wrapped his legs around the heavy ropes from which the bar was extended. "That guy's really strong," George murmured as Hayden released his hands and hung upside down. He kept swinging at a steady pace. "Warm up with a backward somersault. You first, Natalia," Hayden called. Natalia swung out on the bar. "She must be thirty feet off the ground!" Nancy exclaimed. "I'd be scared to death," Bess said, her blue eyes wide. "Even with a safety net!" Natalia brought her feet between her hands on the bar. With lightning-quick grace, the young flyer did a back somersault off the bar. Time stood still as she sailed through the air. Then came a slapping sound. Natalia and Hayden locked hands around wrists. The catch was made! It was so quiet in the arena, Nancy heard Hayden's whoof of exertion on the backswing. "Wow!" George breathed, her dark eyes aglow. But the trick wasn't over. In the next heartbeat, Hayden released Natalia. Nancy saw Natalia's mask of concentration as she twisted and sailed back toward her own bar. The young flyer stretched out, reaching. Then her fingers touched the bar. She'd caught it! Nancy thought. She opened her mouth to cheer, when Natalia's hands slipped. Nancy could only watch in horror as Natalia plunged down, her body twisting out of control.